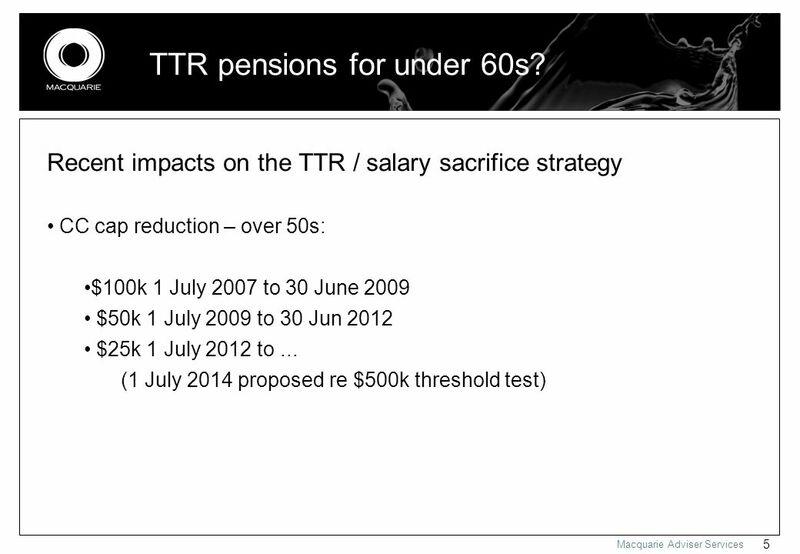 Macquarie Adviser Services Are TTR pensions viable for the under 60s? 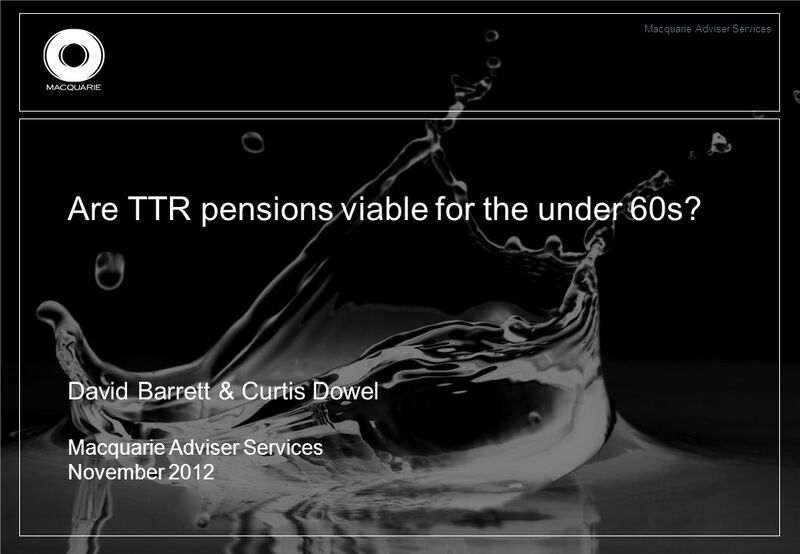 David Barrett & Curtis Dowel Macquarie Adviser Services November 2012. 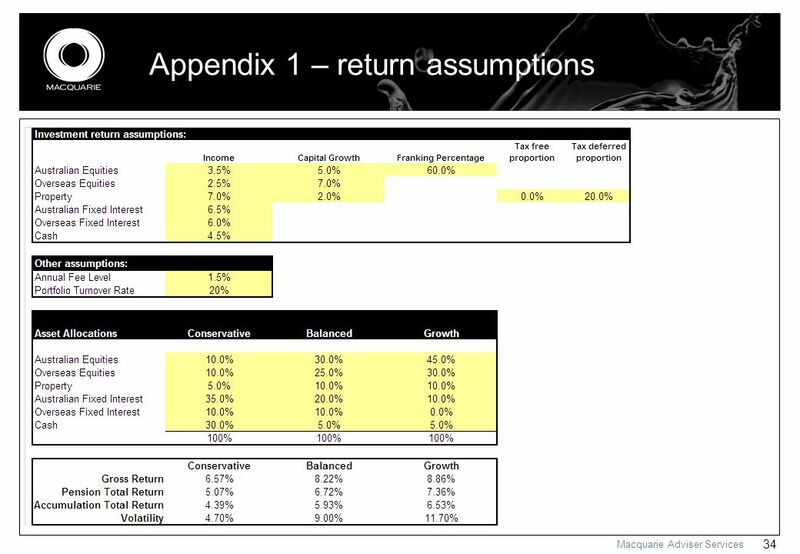 2 Macquarie Adviser Services 2 Disclaimer Macquarie Investment Management Ltd ABN 66 002 867 003 (MIML) is not an authorised deposit-taking institution for the purposes of the Banking Act 1959 (Cth) and MIML’s obligations do not represent deposits or other liabilities of Macquarie Bank Limited ABN 46 008 583 542. 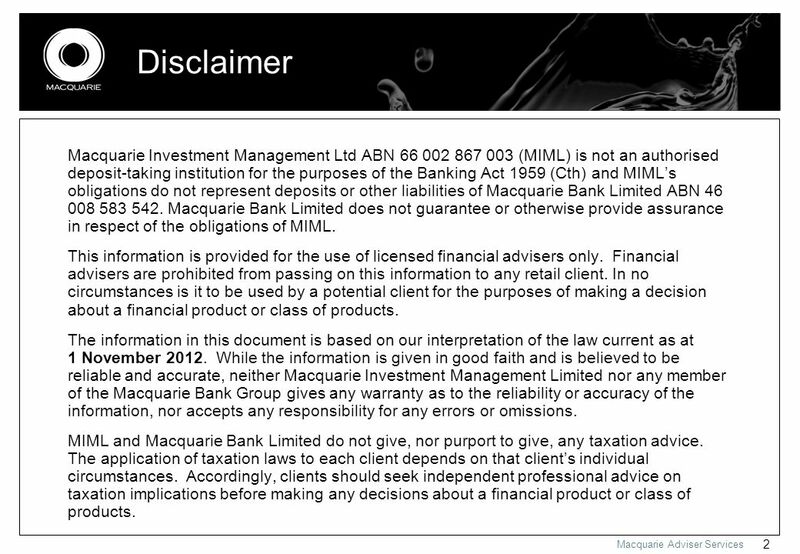 Macquarie Bank Limited does not guarantee or otherwise provide assurance in respect of the obligations of MIML. 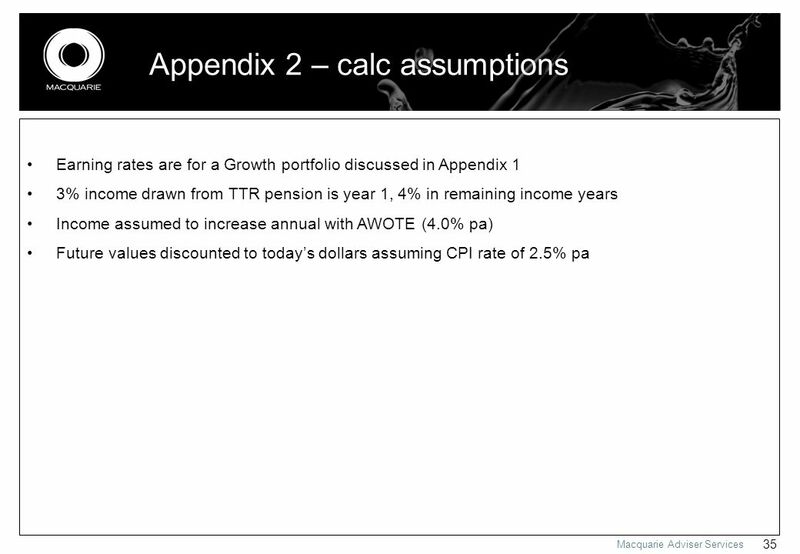 This information is provided for the use of licensed financial advisers only. 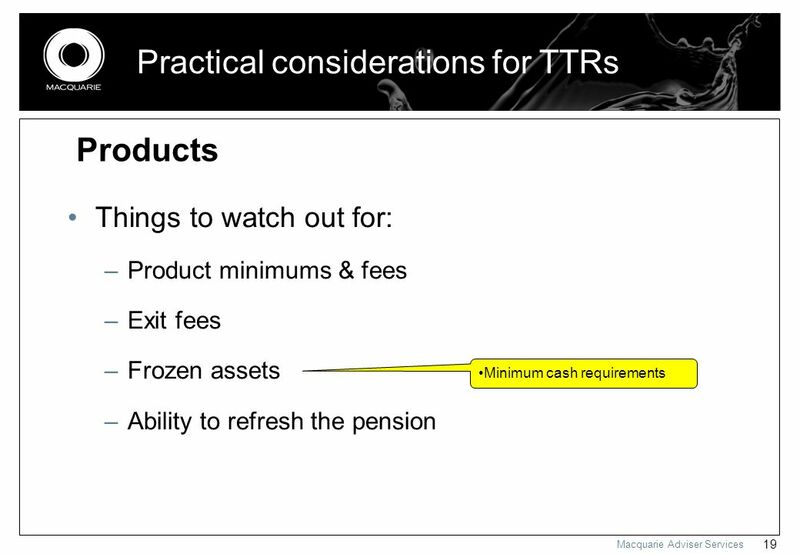 Financial advisers are prohibited from passing on this information to any retail client. 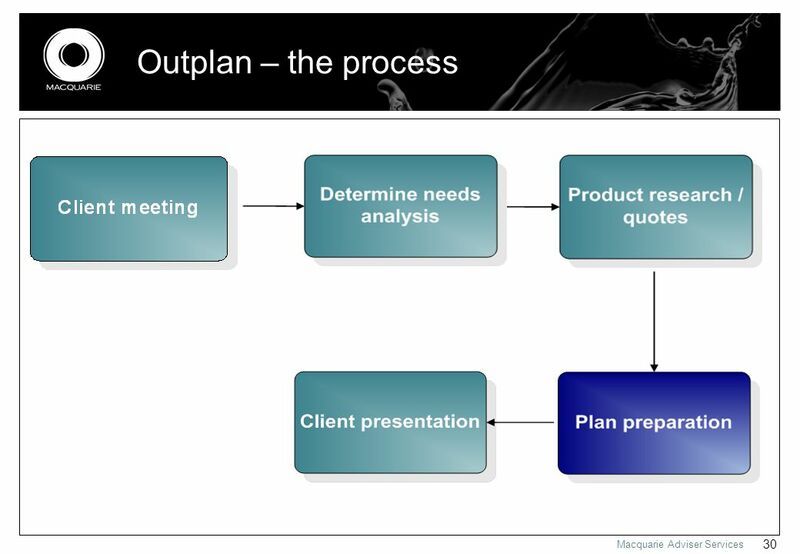 In no circumstances is it to be used by a potential client for the purposes of making a decision about a financial product or class of products. 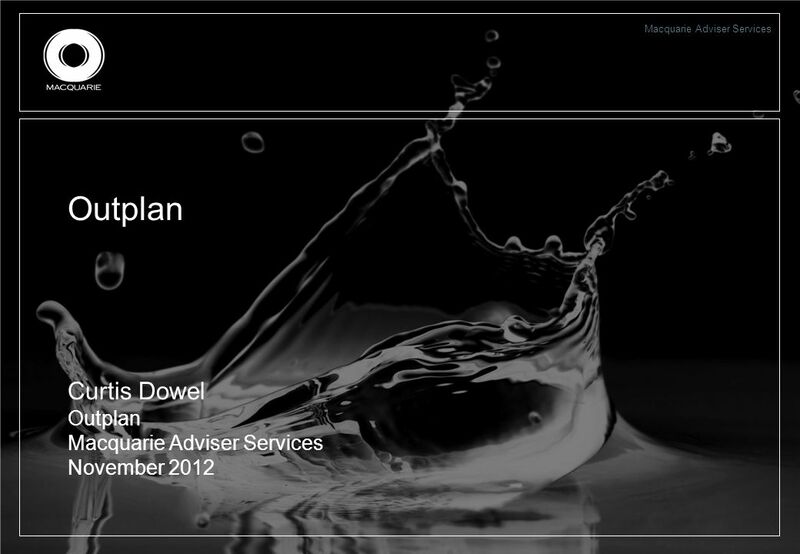 The information in this document is based on our interpretation of the law current as at 1 November 2012. 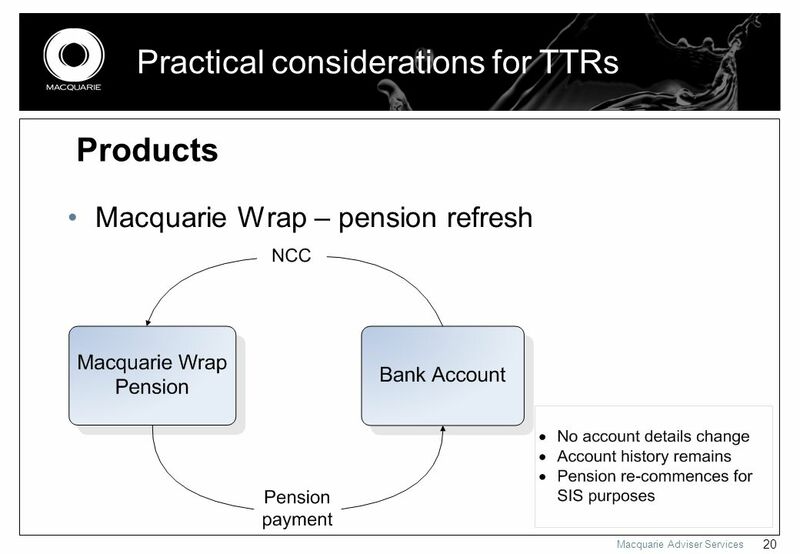 While the information is given in good faith and is believed to be reliable and accurate, neither Macquarie Investment Management Limited nor any member of the Macquarie Bank Group gives any warranty as to the reliability or accuracy of the information, nor accepts any responsibility for any errors or omissions. 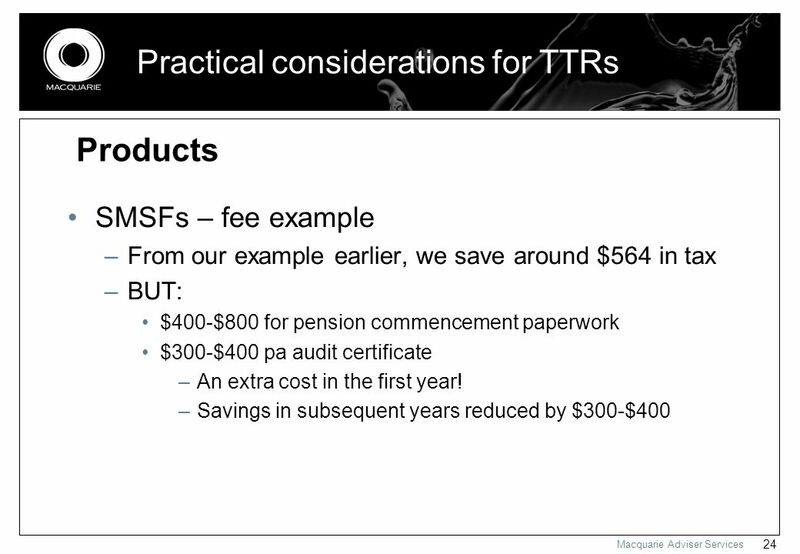 MIML and Macquarie Bank Limited do not give, nor purport to give, any taxation advice. 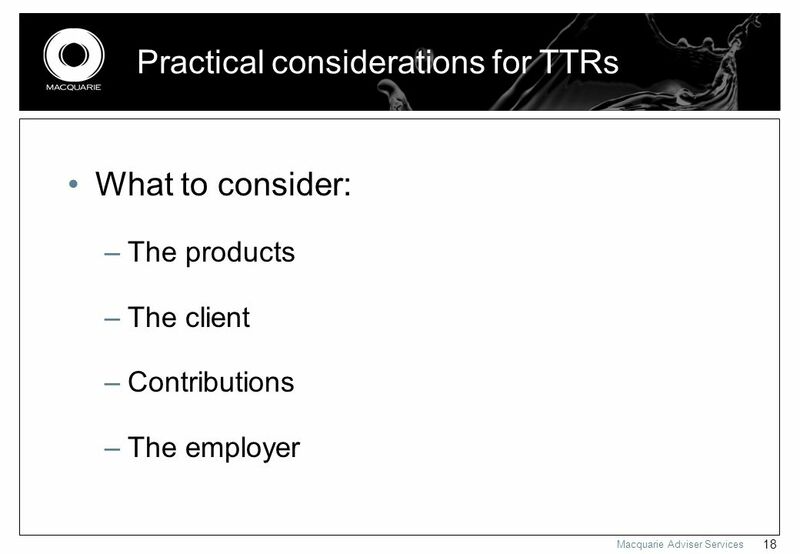 The application of taxation laws to each client depends on that client’s individual circumstances. 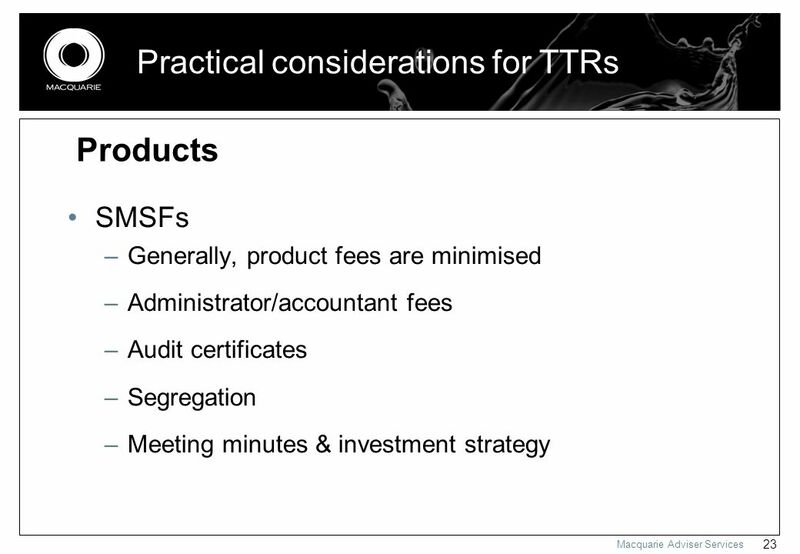 Accordingly, clients should seek independent professional advice on taxation implications before making any decisions about a financial product or class of products. 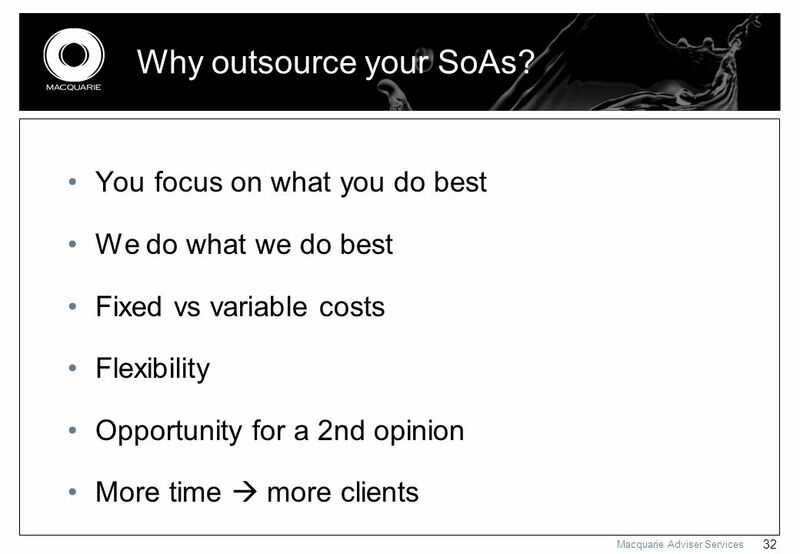 8 Macquarie Adviser Services 8 1. 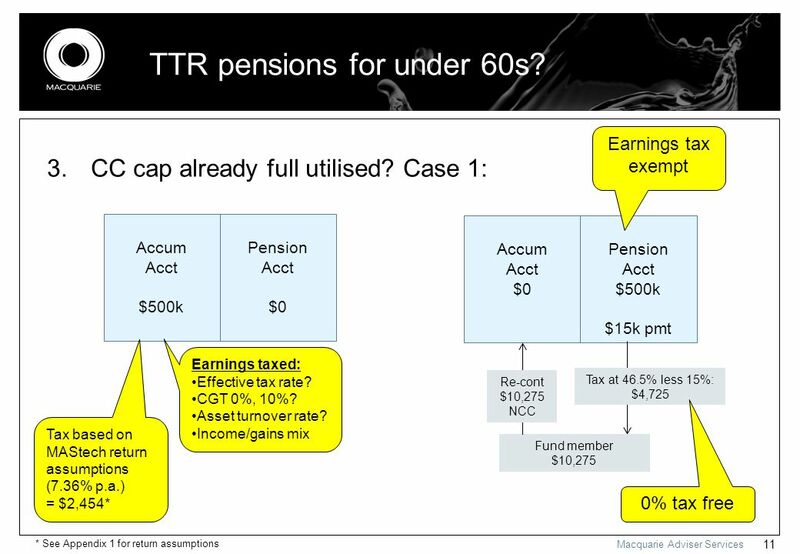 Purpose of TTR pension? 2. 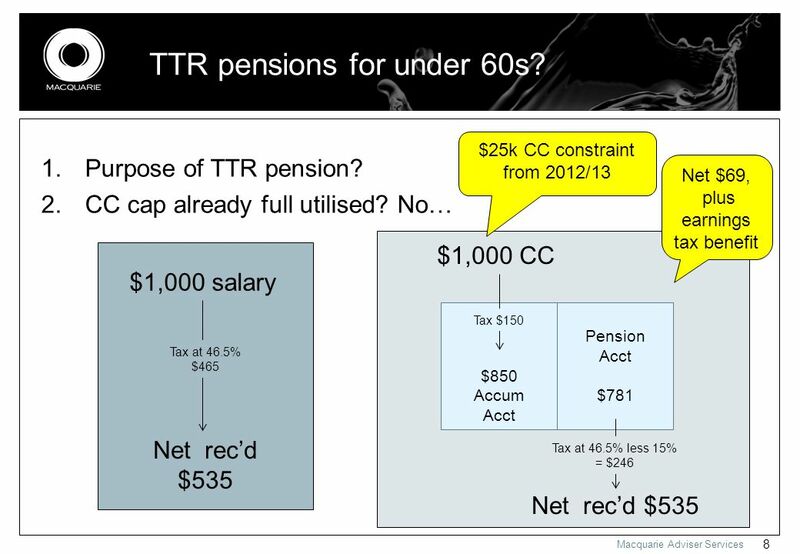 CC cap already full utilised? 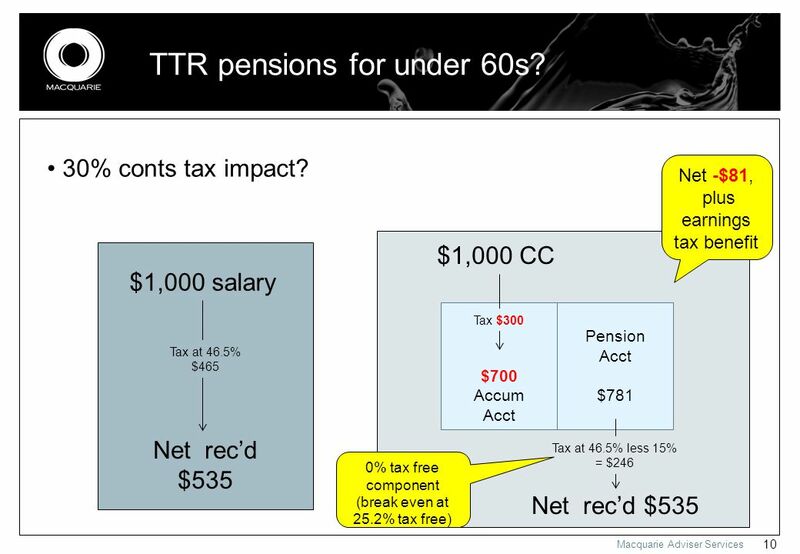 No… $1,000 salary Net rec’d $535 Tax at 46.5% $465 $1,000 CC $850 Accum Acct Pension Acct $781 Tax $150 Tax at 46.5% less 15% = $246 Net rec’d $535 Net $69, plus earnings tax benefit $25k CC constraint from 2012/13 TTR pensions for under 60s? 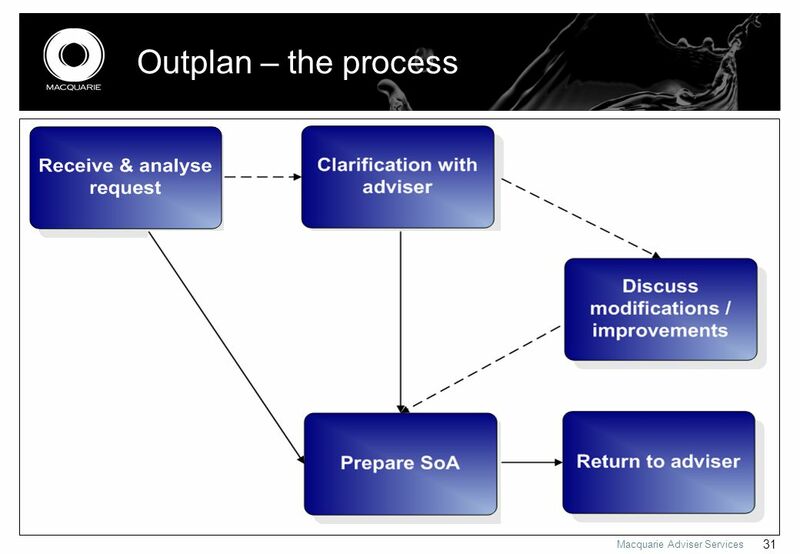 9 Macquarie Adviser Services 9 $850$803$189$614$46 $850$815$155$660$35 $850$841$46$795$9 30% conts tax for $300k+ income – impact? 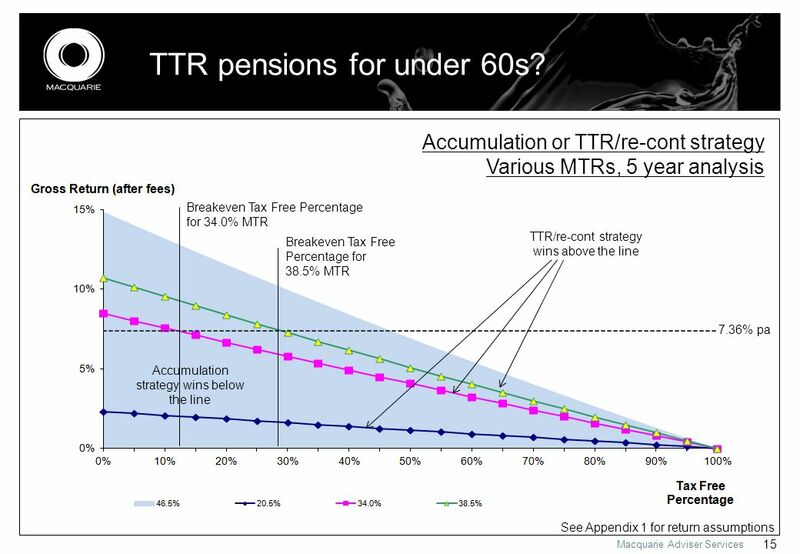 MTR $1,000 salary after tax 46.5%$535 38.5%$615 34.0%$660 20.5%$795 $1,000 CC after tax TTR pension payment Tax on pension payment (15% rebate) Net pension rec’d Benefit of TTR / sal sacrifice strategy * $850$781$246$535$69 * plus impact of tax free earnings on TTR pension account balance TTR pensions for under 60s? 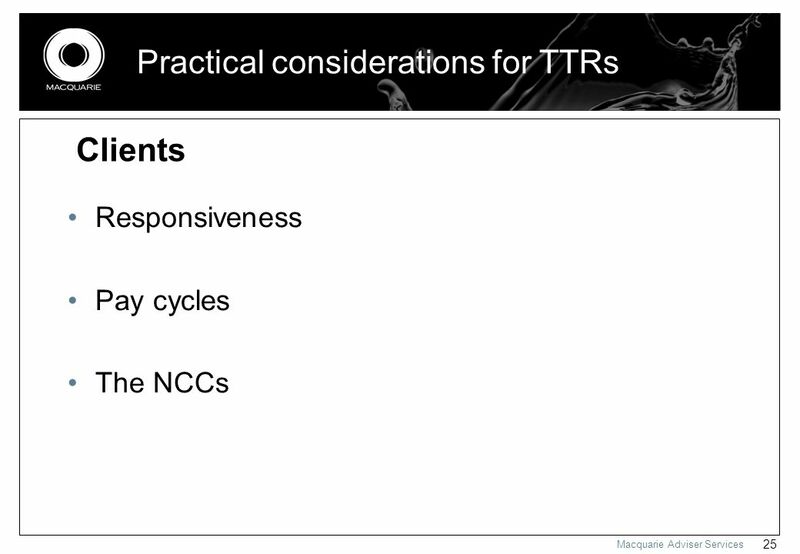 13 Macquarie Adviser Services 13 Accumulation vs TTR/re-cont strategy comparison Identify break-even point by varying: 1. 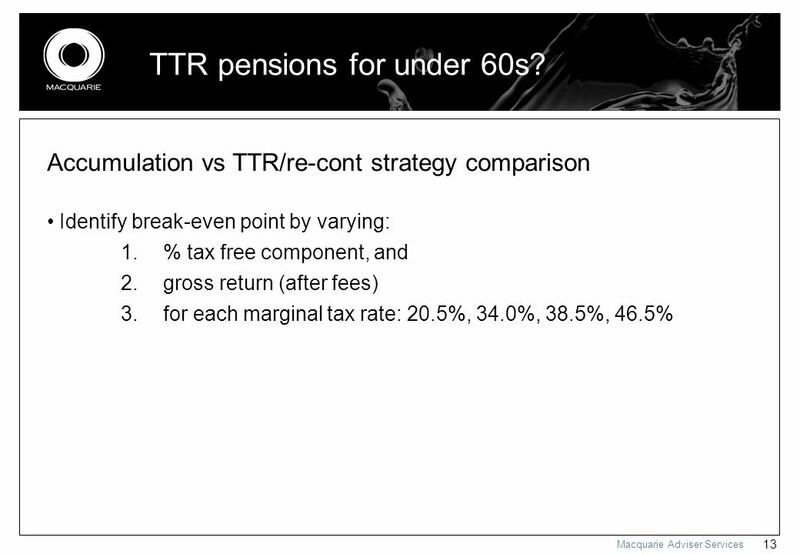 % tax free component, and 2. gross return (after fees) 3. for each marginal tax rate: 20.5%, 34.0%, 38.5%, 46.5% TTR pensions for under 60s? 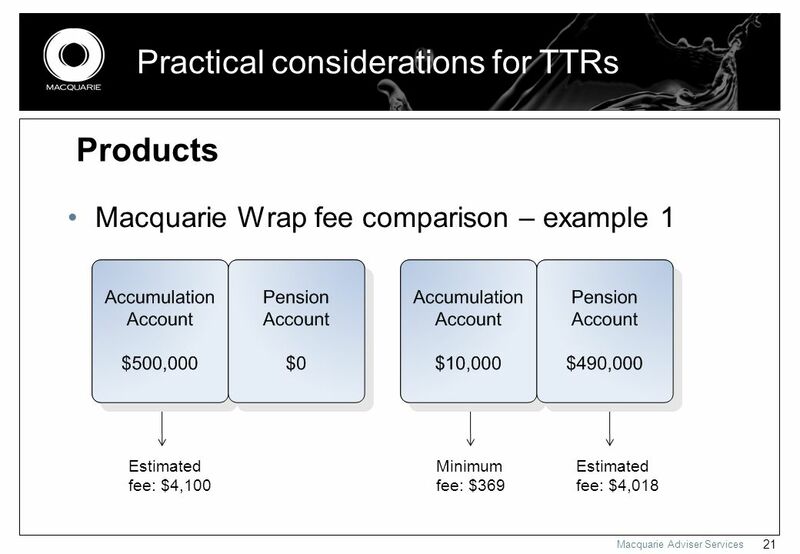 16 Macquarie Adviser Services 16 Summary: TTR pensions may still make sense for: 1. original policy purpose – i.e. 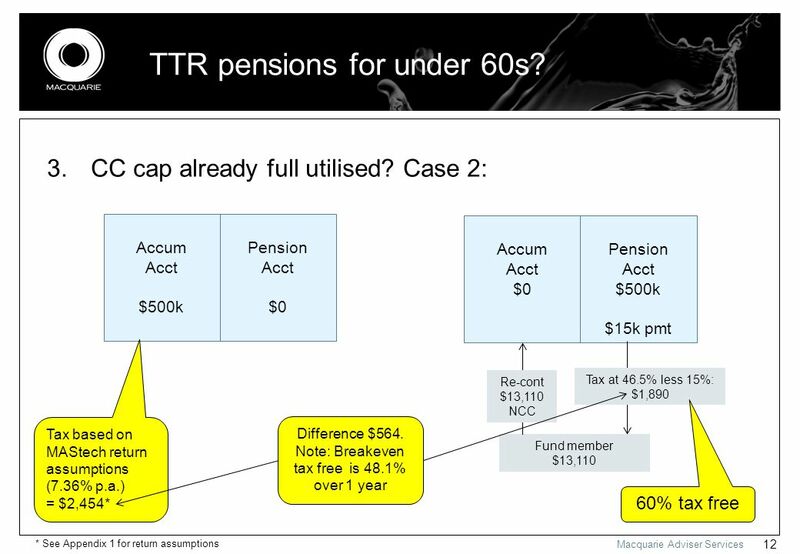 phasing into retirement 2. 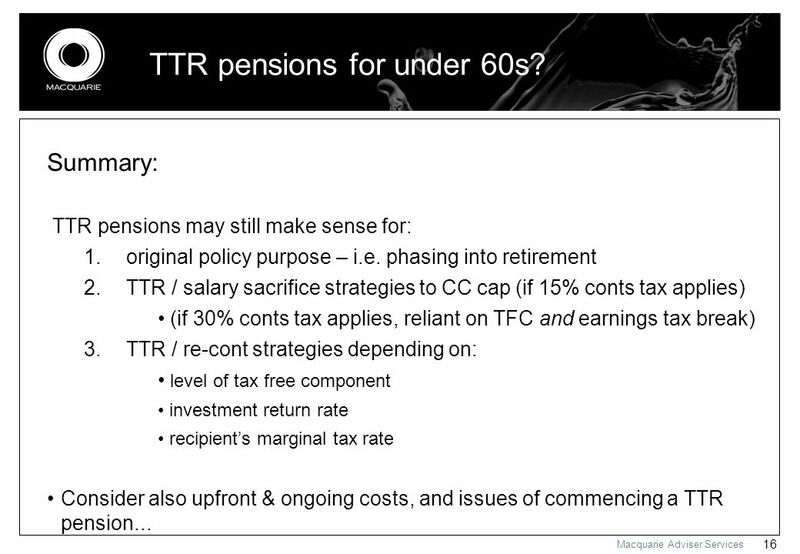 TTR / salary sacrifice strategies to CC cap (if 15% conts tax applies) (if 30% conts tax applies, reliant on TFC and earnings tax break) 3. 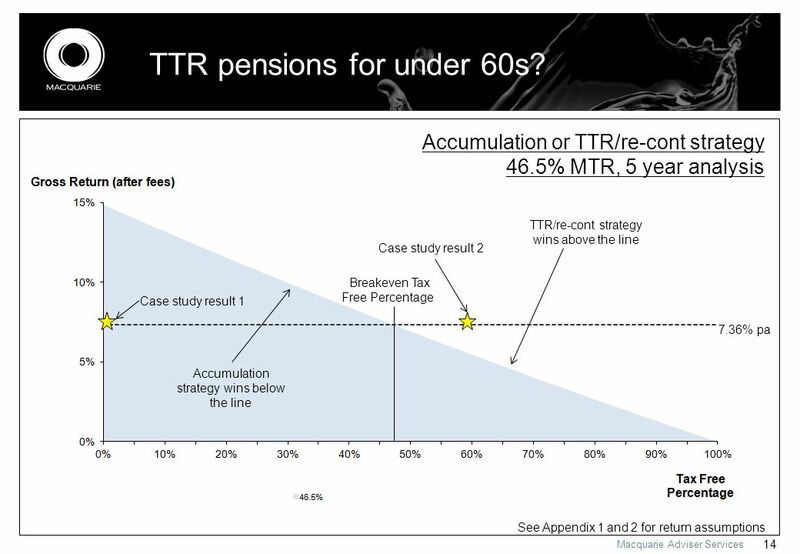 TTR / re-cont strategies depending on: level of tax free component investment return rate recipient’s marginal tax rate Consider also upfront & ongoing costs, and issues of commencing a TTR pension... TTR pensions for under 60s? 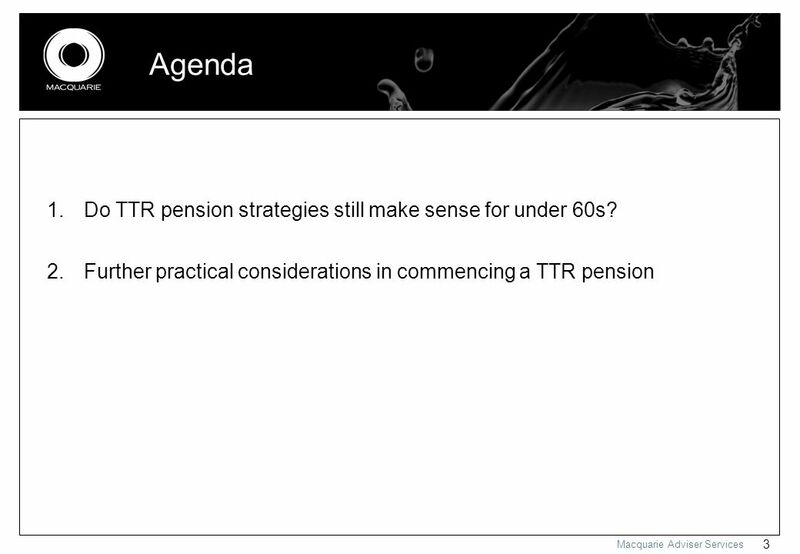 27 Macquarie Adviser Services 27 Practical considerations for TTRs Treatment of salary Where should contributions be made? 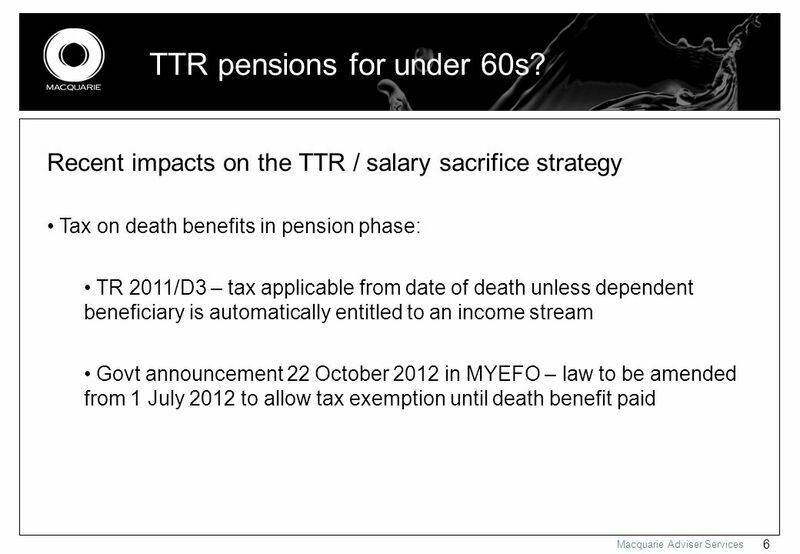 Employers Defined benefits? 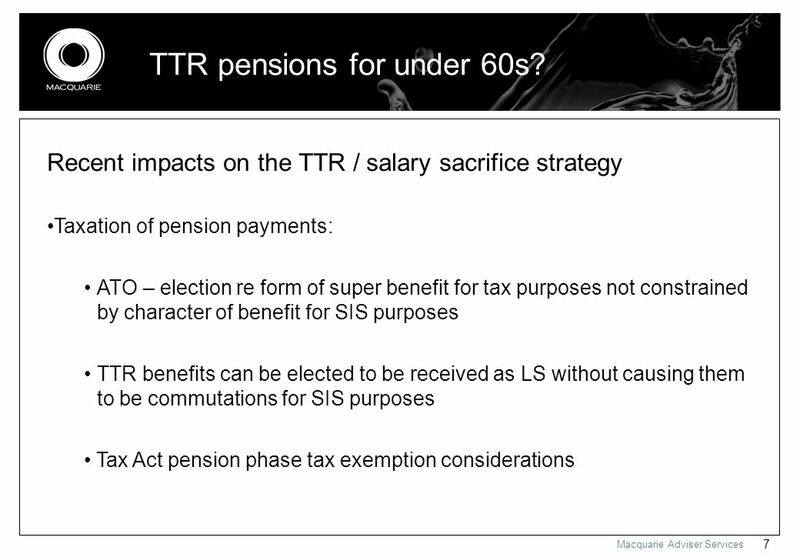 Extra contributions? 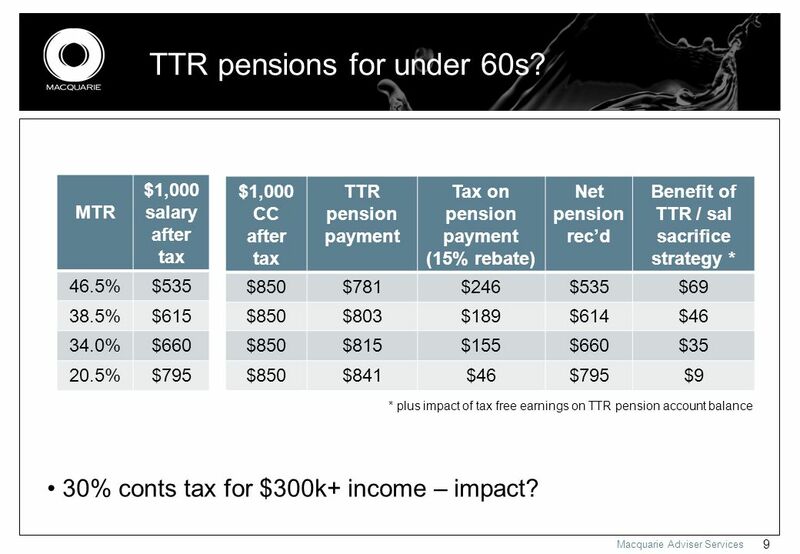 Employer funded insurance? 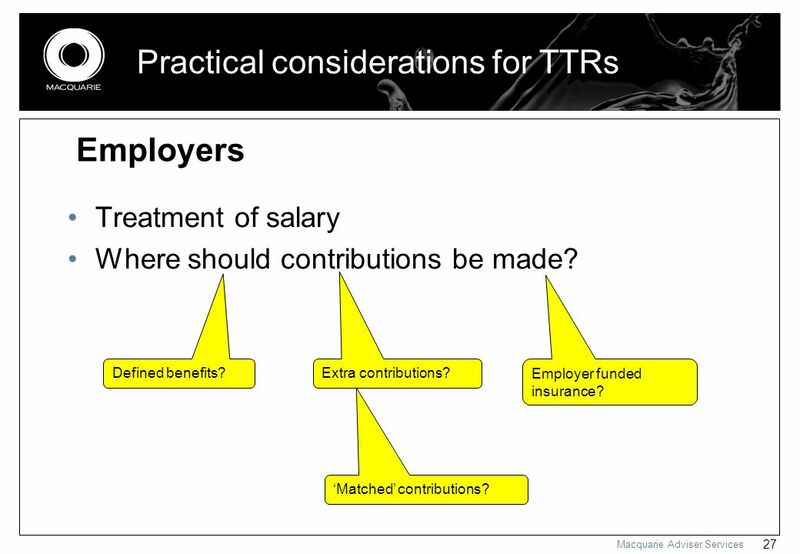 ‘Matched’ contributions? 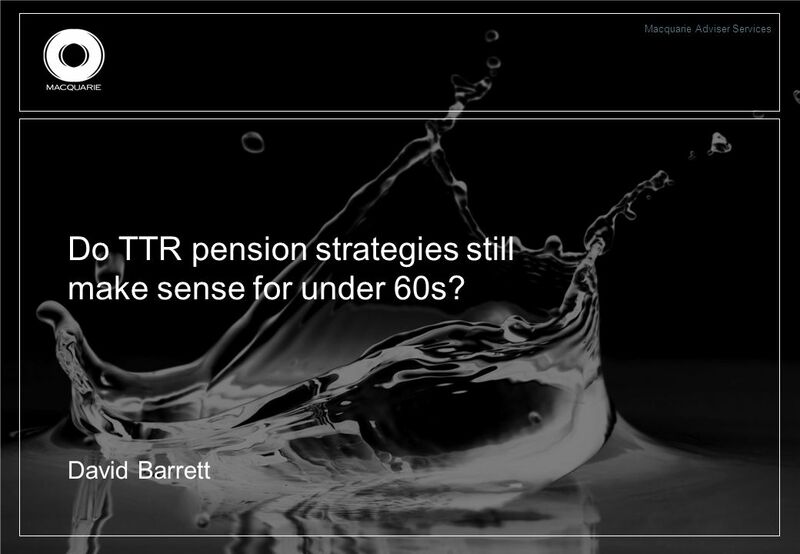 Download ppt "Macquarie Adviser Services Are TTR pensions viable for the under 60s? 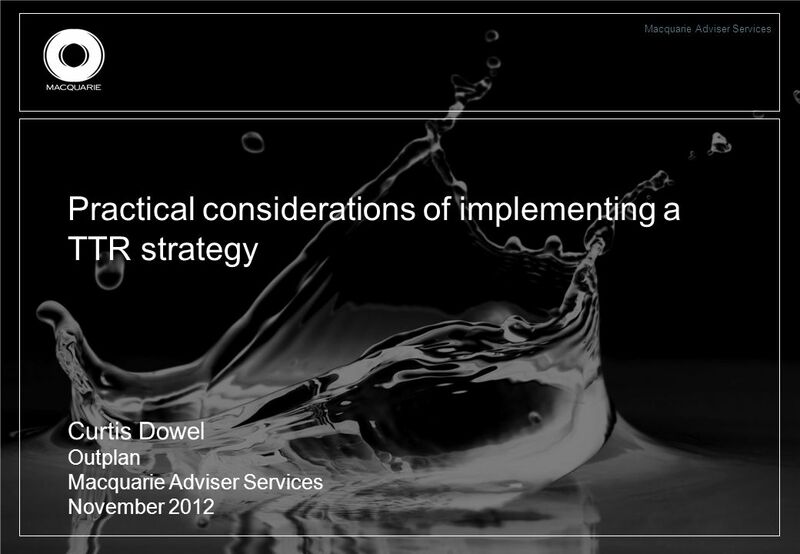 David Barrett & Curtis Dowel Macquarie Adviser Services November 2012." Credit Card Understanding Your Credit Card Credit Cards 101 Trivia. Slippery Slope 25 19 13 7 1 26 20 14 8 2 27 21 15 9 3 28 22 16 10 4 29 23 17 11 5 30 24 18 12 6.